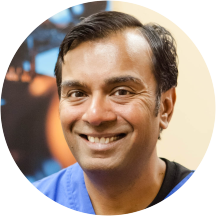 Dr. Sundip Patel is a medical optometrist operating offices next to Eyemart locations in the Greater San Antonio area, serving New Braunfels since 2005 and Schertz since late 2012. Working with patients ages six and up, he is a competent and compassionate individual who takes time to thoroughly explain all eye-exam results to those in his care. He is a fee-for-service provider interested in giving you the best eye care possible. Since he does not sell glasses, he offers patients unbiased advice regarding any questions or concerns they might have. Because he doesn’t own the building or the equipment, he is able to keep his overhead low and passes those savings on to his patients. He provides wellness eye exams as well as medical eye exams monitoring for conditions including glaucoma, macular degeneration, diabetes, hypertension and cataracts. He also takes office visits for infections, foreign bodies, corneal abrasions and vision loss. In addition, he has plenty of experience fitting contact lenses of all kinds and you are able to purchase contacts lenses form his office. With the capability of having them shipped directly to your home. Dr. Patel received his training from The Pennsylvania College of Optometry, one of the oldest schools of the practice in America. When Dr. Patel isn't busy helping patients, you can find him spending time with his family, working on his car or cheering on the Spurs. Great eye visit with Dr Patel, he also recommended I get tested for Dry Eye. Testing and results are done in his office as well. Very convient and knowledale when it comes to dry eye. As always, Dr Patel was pleasant and professional while being quick. Glad he is my eye Dr. The entire staff from reception to the doctor was very welcoming and professional. I am happy to have stumbled upon such a good eye doctor and staff. Extremely knowledgeable and took the time to understand my concerns before looking to a diagnosis. Dr. Patel is great! I’ve been going to him for years and would like to always have him as my eye doctor. I trust him and his opinions completely, I recommend him to anyone who is looking for an eye doctor. He’s absolutely great! Dr. Patel is a great doctor, he is great at explaining what is going on and giving good reasons for everything he does. He seemed very knowledgeable and competent. He explained everything he was doing and encouraged followup care. He was concerned about my brother's eye health and I certainly will have him as our family eye doctor. Dr. P treated me as a VIP, very knowledgeable and super super professional. He did his job well and also expressed concern on my eyes' health. I've never been to an eye doc that was so professional. Staff was helpful, nice and friendly. Loved Dr. Patel. He was very polite and explained everything in a way I could understand! Great bedside manner! Very happy with him and his office! Dr.Patel was amazing he really took the time to make sure my kids were getting the best care for their eyes and I feel very confident in the care they received I highly recommend. Always a pleasure to visit this office. The Dr. is Professional and kind. The staff is attentive. Each one of the staff takes their time to make sure you are comfortable while their. Except for the wait time, the appointment was good. Dr. Patel seemed like a very caring Dr.. He seems thorough in the care he is giving you. His staff are nice and are very well knowledgeable about what their job is. Dr. Patel is professional, kind, courteous and takes times to inform and educate his patients. I was with the same optometrist for over 20 yrs and never once did that doctor take the time and care that Sundip Patel has demonstratedeach time we have been to see him. He is professional and thorough. I wish I would have discovered him sooner! His staff is courteous and they talk you through each step. The office staff is equally kind and welcoming. I highly recommend Dr. Patel! You won't be disappointed. Michelle K.
Amazing OD and very knowledgeable about what is going on and the actions needed to take to better my health in my eyes! We love Dr. Patel, he’s been seeing my kids for years. He’s very knowledgeable and professional. Our visit with Dr. Patel was spectacular. The best I have ever had. He is very professional and knowledgeable at his field of expertise. The wait time was minimal and the staff was very efficient. Dr. Patel is excellent ! I learned so much about my eye condition that was never explained or treated properly by any other doctor . I’m so happy that I’m his patient and getting treatment that I understand . He isvery good at explaining things and is very thorough . Definitely recommend Dr. Patel very highly ! I LOVE this office. Everyone in this office has been & always is so friendly. I love that they explain every process they do. If you have questions, they stop then & explain with as much detail as possible. I trulyfeel Dr. Patel genuinely cares about his patients. I highly recommend this office to anyone needing to see an eye doctor or has any other problems or concerns about their eyes. This doctor was awesome. Very knowledgable. Made sure I understood what he was saying. Very passionate about his job. Definitely keeping him as my eye doc. Fantastic. He really cares about his patients! Very professional. The staff was nice. Dr Patel was very good with making sure the vision was clear not just okay. Dr. Patel, OD is very professional & friendly. He tells you the what and whys of your condition very well and lets you know how to care for yourself at home. This is very much appreciated. Thank you Dr. Patel, OD. Wait time was over 30 minutes, including the 15 minutes I was required to arrive early as a new patient, for at least 45 minutes. Everyone "was" nice, but I felt the doctor was feeding me with "so" much information usingmedical terminology rather than in layman's term, that I was totally overwhelmed. He was constantly talking "medical" and being a nurse, there is no way a patient can take in that much information in one sitting. I personally would not go back to him. I love Dr. Patel. Our family has been going to him for years. He is so thorough and really cares about your eye health. Super visit and very informative! As always, it was great! I went to have a procedure done that I was quite nervous about, but Dr. Patel and his staff put me at ease right away. Dr. Patel explains everything he's going to do, explains what Ineed to do after, and there has never been 1 second in the time I've been seeing Dr. Patel that I didn't trust him 100%!! If you're looking for an exceptional eye Doctor, make an appointment with Dr. Patel. You won't be disappointed!!! Very informative, did not rush with me. Always wanted to know if I was happy with what was being done and if I understood. Love that he was concerned about if I had any questions at all. Really was a wonderfulfirst impression on my first visit! I will use him again in with all my eye needs. Dr. Patel and staff are professional, courteous, and friendly. I have been seeing Dr. Patel for close to 10 years and have never been disappointed with his professionalism or skills. I feel confident that if he were not able to attend to my needs, he would refer me to someonewho could. Luckily, that has not happened. I highly recommend Dr. Patel and his staff for patients of all ages. Dr. Patel is professional, personable, attentive, sincere and highly knowledgeable. I have complete confidence and trust in his skill and competence. Our wait was slightly longer than anticipated due to a walk-in patient with an immediate issue. I was happy to see that Dr. Patel seated the patient. He is very professional, very nice, calm demeanor, actually cares about what he's doing and in making sure the patient understands what's going on. I will never go to another Optometrist as long as Dr. Patel is in practice!! Dr. Patel was professional and explained things indepth and to my understanding. I like Dr. Patel's bedside manner. He is direct and informative. He doesn't waste your time but he makes sure to answer all questions and keep me informed about my eye health! Staff very friendly. Dr took time to explain everything to me and made sure that I understood his explainations of procedure and care. As usual, a most pleasant visit. Dr. Patel provides plenty of info so I can understand why he's offering the suggested treatment and answers all my questions! My family and I have seen Dr Patel for many years. Dr Patel and his staff have always made us feel right at home. Hes a wonderful and caring doctor. He was great with my daughter, took time to explain things. Definitely recommend him to anyone that needs a new eye exam. Dr. Sundip Patel, OD has no appointments on Zocdoc right now.